Otosome - Turbo is composed of various components, including turbines, compressors, shafts, and casing as the main part. The use of turbo is also supported by various supporting components such as the air conditioning, the system ECU (Electric Control Unit), the distribution of lubricating oil, and so forth. 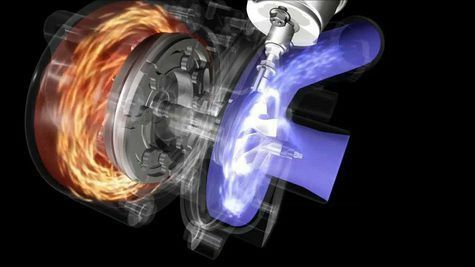 Turbo or also commonly known as the turbocharger is an additional component of the motor fuel which serves to increase the amount of air entering the combustion chamber, by utilizing heat energy contained in the engine exhaust. The flue gas that still contains heat energy is passed to a turbine for converting heat energy into mechanical energy shaft rotation. A compressor which is a shaft with a turbine, utilizing mechanical energy earlier to provide more air into the combustion chamber. If on a motor-cycle combustion air in the combustion chamber put in more quantity, it is also possible in one cycle of the fuel put into the combustion chamber is also becoming more numerous. In normal conditions, the intake air into the combustion chamber is a result of the suction motion of the piston. Suction piston movement creates a negative pressure in the combustion chamber, which if followed by the opening of the valve manifold, then the air in a certain amount will be entered into the combustion chamber for inlet air pressure (atmosphere) is greater than the pressure in the combustion chamber. And because the rotation cycle of the motor fuel to work very quickly, then the air entering the combustion chamber during the suction cycle amounts to relatively little. The relatively small amount of air will be followed with the least amount of fuel that goes in accordance with the system settings mixing fuel in the combustion chamber (carburetor or injection). With this condition, the engine power that is generated is relatively low. The use of turbocharger will increase the power output of the motor fuel. Because of the turbo compressor will increase the pressure and quantity of air entering the combustion chamber during the suction cycle. Automatically, the quantity of a mixture of air and fuel into the combustion chamber at the motor-cycle will be more. The quantity of fuel and air mixture that is what produces more total power cycle becomes greater than a conventional machine that does not use turbo. The generation of relatively greater power, enabling the motor vehicle manufacturers to design machines with the capacity of the combustion chamber is small, but it produces the same total power with a large capacity engine.